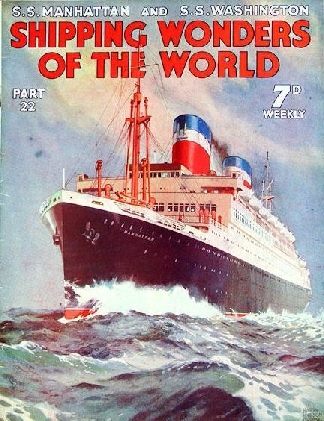 Part 22 of Shipping Wonders of the World was published on Tuesday 7th July 1936. It included a centre photogravure supplement featuring the America’s Cup, which formed part of the article on this historic contest. This week’s cover is by Harry Hudson Rodmell, who makes his first association with Shipping Wonders of the World with a splendid impression of the Manhattan. Rodmell’s signature may be seen in the extreme lower right of the cover. America’s most luxurious liners on the North Atlantic service are the sister ships Manhattan and Washington, built for the United States Lines in 1931-33. These are two of the finest liners in the United States Merchant Service and they run between New York and Hamburg. Identical in outward appearance, each ship has a gross tonnage of 24,289 and a length of 668 feet. The Manhattan carries 1,239 passengers and the Washington 1,100 passengers. Three are certain interior differences in the two ships. It was a great event when the Manhattan, the elder ship of the two, was built. She was the first liner for the North Atlantic trade to be built in an American yard for thirty-five years; the launching ceremony was carried out by the widow of President Theodore Roosevelt. Soon after the Manhattan had started on her maiden voyage, the Washington was launched. This chapter is by Sidney Howard and is the sixth article in the series on the World’s Largest Ships. The opening of the Kiel Canal in June 1895 by the German Emperor Wilhelm II marked an important stage in the growth of Germany as a maritime power. The canal made Kiel one of the greatest naval bases in Europe. The Kiel Canal was originally cut as part of the Emperor Wilhelm II’s scheme for naval development. For hundreds of years men had been considering the possibility of cutting a channel through the isthmus which joins Germany and Denmark thus avoiding the long and dangerous passage through the Skagerrak and the Kattegat. It was not until Germany made a bid for sea-power, however, that the dream became a reality. Although it was designed for strategic purposes, the Kiel canal is of enormous commercial importance, linking, as it does, North Sea and Baltic ports. During 1934 more than 40,000 ships used the canal. This chapter is by Sidney Howard and is the eighth article in the series on World Waterways. The first of the historic races for the America’s Cup was held off the Isle of Wight in 1851. Since that date the rivalry of the British and American contestants for the valued cup has been the subject of great public enthusiasm on either side of the Atlantic. This chapter is written by Frank Bowen, and is the first of several on yacht racing. The America’s Cup is, at intervals, competed for by yachtsmen from Great Britain and America. This chapter not only gives a comprehensive account of the various races for the cup, but it tells also of the history of the contest and of the yachts which have entered for it since its inception. 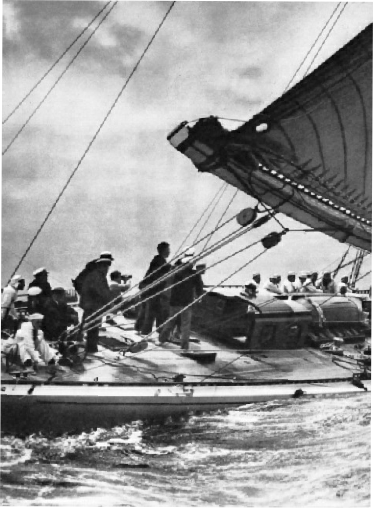 This absorbing chapter is illustrated with pictures of racing yachts, including four pages in photogravure, illustrated below. The story of the salvage of the K 13, concluded from part 20. You can read more about this salvage in chapter X of David Masters’ book The Wonders of Salvage. The drawing show in the full article illustrates a type of vessel employed in the carriage of railway goods wagons from Harwich to Zeebrugge. This vessel, known as Train Ferry No 3, was built in 1917, and was armed. She originally ran from the artificial port of Richborough, in Kent, to French ports, loaded with hospital trains, locomotives and wagons for heavy guns. She was taken over by Great Eastern Train Ferries Ltd, after the war of 1914-18, and converted from coal to oil-burning. She is now owned by the LNER. This is the seventeenth article in the series on Merchant Ship Types. RACING THROUGH THE SEAS with every man of her crew braced for the strain. 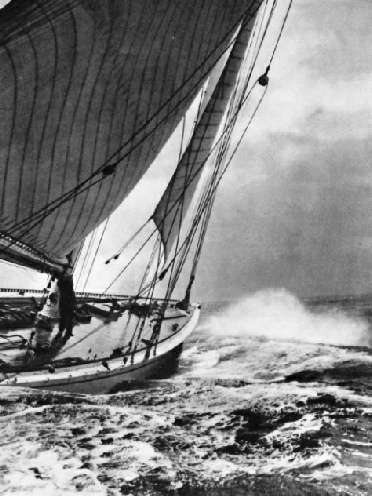 This photograph of the Yankee was taken in the Thames estuary during a race in 1935. 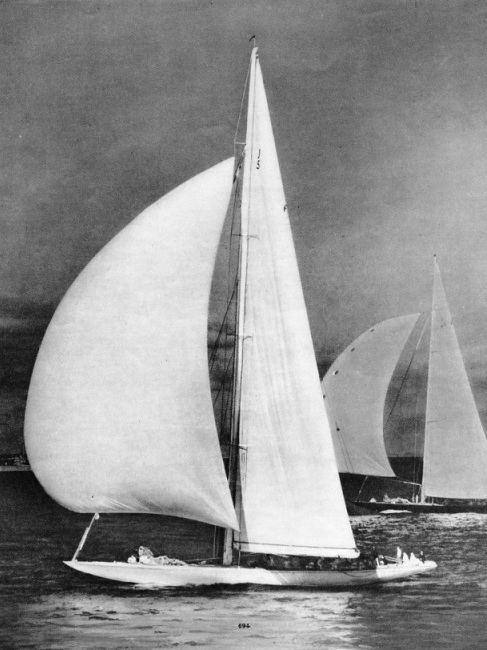 The Yankee was one of the candidates fro the defence of the America’s Cup against Shamrock V’s challenge in 1930, but the Enterprise was eventually chosen. The Yankee crossed the Atlantic to race in British waters in 1935. The limitation of space in early steamships led to the introduction of many ingenious arrangements in their machinery. Important among these were the famous trunk engines that once drove Great Britain's warships and were in themselves fine examples of marine engineering. This chapter is by F E Dean and is the fifth article in the series Marine Engines and Their Story. TWO FAMOUS YACHTS in an exciting contest. In the foreground is Shamrock V, with which Sir Thomas Lipton challenged the American Enterprise for the America’s Cup in 1930. The British yacht was unsuccessful in her four races against the Enterprise, with her innumerable modern devices. In the background is the famous Britannia with her black-painted hull. She was owned by King George V, who was an enthusiastic yachtsman and often took the wheel himself in races. 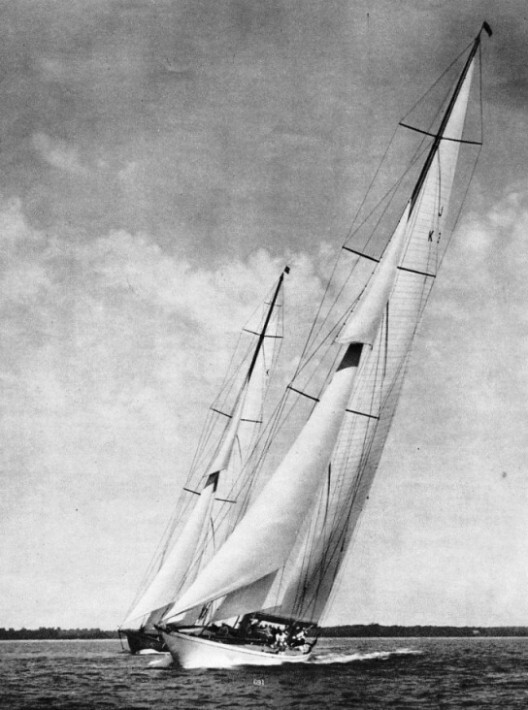 THE AMERICA’S CUP DEFENDER in the race against Sopwith’s Endeavour in 1934. The Rainbow was designed by Starling Burgess, son of Edward Burgess, the famous naval architect and yachtsman who in 1881 built the Puritan on revolutionary lines. The contest between the Endeavour and the Rainbow was one of the keenest in the history of the America’s Cup. The Rainbow won four races out of the first five; on the last occasion she won by a margin of only fifty-five seconds. During recent years a number of daring single-handed voyages have been made across the oceans in small boats, but Captain Joshua Slocum in 1895-98 was the first man to sail single-handed round the world. He was a master mariner who had experienced misfortune, and his achievement stands out supreme in the annals of the ocean for efficiency and courage. His experiences were subsequently recorded in his book Sailing Alone Around the World (1900). This chapter is by Sidney Howard and is the fifth article in the series Great Voyages in Little Ships. The article is concluded in part 23.